Tired of post-apocalyptic games set in the U.S.? No worries, THQ has your back: They've just unveiled a post-apocalyptic game set in Moscow. 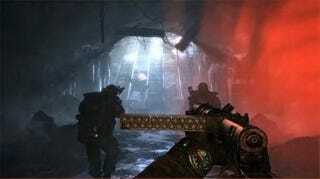 First-person shooter Metro 2033, which is due to hit the PC and Xbox 360 in 2010, has you taking on the role of a man born in the days before most of humanity is wiped out by an apocalyptic event. Now, 20 years later, you have to make your way to the center of the Metro system to warn survivors of an impending threat. The game, which is based on Dmitry Glukhovsky's novel Metro 2033, is being developed by Ukrainian studio 4A Games. "Metro 2033 will plunge gamers into a terrifying vision of the future," said Richard Williams, vice president of global brand management, THQ. "4A Games have worked closely with Dmitry Glukhovsky to deliver a unique game world, a compelling, cinematic story and an incredible, atmospheric experience to rival anything in the category." "Metro 2033 boasts some of the most advanced graphics and PhysX effects we've ever seen," said Ujesh Desai, vice president of GPU business at NVIDIA. "From what we've seen so far, this will be a showcase PC gaming title for 2010!"